Limited Edition bundle available as fundraiser for FMS preservation efforts—SOLD OUT! 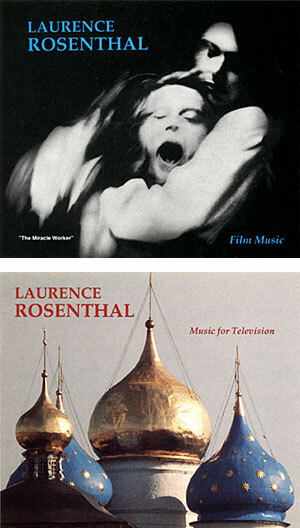 For a limited time only, The Film Music Society is making available The Rosenthal Package, consisting of two sought-after soundtrack collections: Laurence Rosenthal: Film Music and Laurence Rosenthal: Music for Television. Both two-CD anthologies – mastered from original music production recordings – were produced as promotional items by Rosenthal (the latter co-produced with Douglass Fake) and offered to attendees of the FMS' 1999 Career Achievement Award dinner honoring the composer. This assemblage of Rosenthal's film and TV music is an irreplaceable overview of one of Hollywood's most influential and respected composers. All selections are conducted by Rosenthal (except for cues from Becket, conducted by Muir Mathieson). Among the rarest offerings included on this four-CD bundle is Rosenthal's complete score for The Miracle Worker, the landmark 1962 film which earned Oscars for Patty Duke as Helen Keller and Anne Bancroft as Annie Sullivan. This score is unavailable anywhere except in this collection. Neither CD set will be sold separately! They are only available for purchase together in The Rosenthal Package! 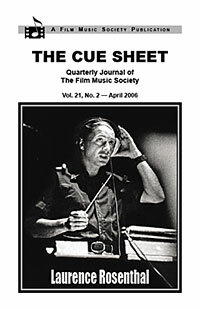 As a bonus, we include a copy of the Society's publication, The Cue Sheet Vol. 21, No. 2 (April 2006), a special issue honoring Rosenthal's accomplishments in film, TV and theatre, featuring an exclusive March 2006 interview with Rosenthal by Jon Burlingame; articles by Inside the Actors Studio host James Lipton, composer Bruce Broughton, composer Steve Bramson and lyricist Dennis Spiegel; comprehensive filmography, discography and theatre credits; and a selected bibliography. According to FMS President Christopher Young, "Larry Rosenthal, one of the greatest film composers of all time, has always been a strong supporter of the Society and what we represent. We are so lucky to know him, and we offer this fantastic fundraising item with our sincere gratitude for his encouragement." The price for The Rosenthal Package is $70 for members, $80 for non-members, plus shipping and handling. Hurry! Only 40 packages available! Proceeds go toward the Society's efforts in film music preservation. The Cue Sheet Vol. 21, No. 2 is available alone for $10. Orders can be placed by phone, fax, mail or e-mail. If you would like to become a member of The Film Music Society, please visit our Membership Page and read about the benefits of contributing to film music preservation.